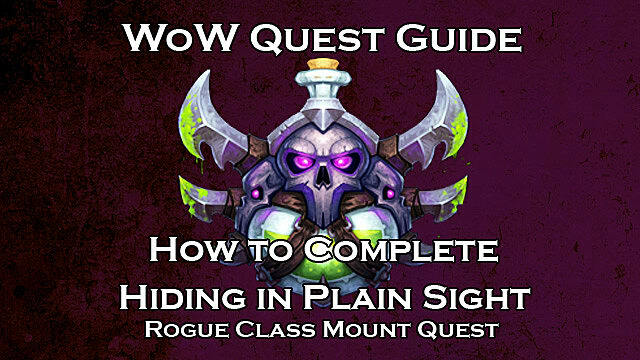 "Hiding In Plain Sight" is the last quest a Rogue needs to complete to obtain their new class mount in World of Warcraft. While the central premise of the quest is the same for both Alliance and Horde -- killing four NPCs -- where and who those NPCs are changes depending on the player's faction. 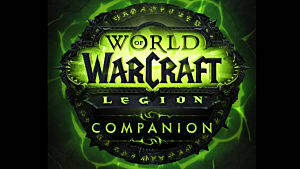 In this guide, we're going to go over how you can complete this quest, whether you're a member of Alliance or Horde. Keep reading to learn everything you need to know, or use the links below to jump right to where you need to be. 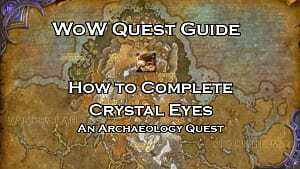 You will need to have completed all the Broken Shores questline. This quest does not have personal spawns, which means you may have to wait for respawns if a fellow Rogue gets to the mark first. 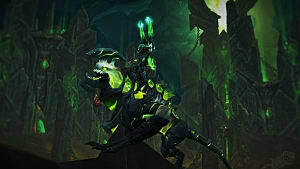 You will be flagged for PvP, and there is no way around this if you want the class mount. 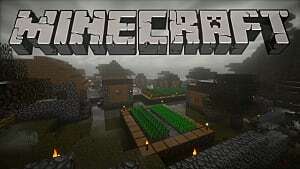 There’s an unfortunate possibility that you may die from other players who might be camping or near the NPCs you need to kill (100% chance on a PvP server, about a 50% or less chance on PvE). It might be worth your time to make a toon of the opposite faction if you’re not acquainted with their cities’ layout. 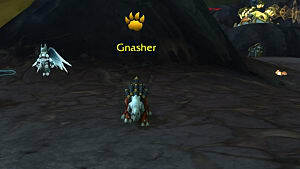 Whether you're Alliance or Horde, you'll need to pick up the "Dread Infiltrators" quest. This quest starts at Apothecary Keever (Broken Shores, Deliverance Point), and sends you to Lilian Voss (Dalaran, Chamber of Shadows). Let's go over each smaller objective and how you should go about completing it. Your Silvermoon Mark is Tercin Shivenllher. From Dalaran (Legion) take the portal to Dalaran crater (have your Safe Fall ready). 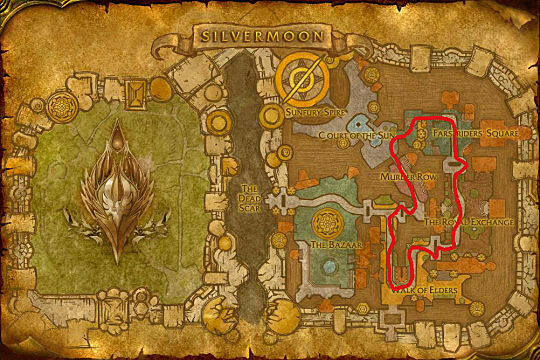 From there, fly to the Eastern Plaguelands and take the instance portal to the Ghostlands, then run towards Silvermoon City in the north. Tercin and his bodyguard, an Arcane Demolisher, walk around the city in a loop. Distract or Blind the Arcane Demolisher, so it separates from Tercin. Otherwise, it will one-shot you if you try to kill him with it still around. Your Undercity Mark is Mistress Matilda. Head to Dalaran (Legion) from Silvermoon and take the Dalaran Crater portal again (have your Safe Fall ready). From there, you just have to fly across the lake to the north to get to the Undercity. Go into the city stealthed, and make your way to the canal area of the Rogues’ Quarter. Find a safe spot to mount up and fly. You’ll see a balcony where a party is going on. Matilda goes back and forth, mingling with the other partygoers. There are Elites at this party, and they hit like trucks. The best spot to stake out is in the center of the balcony, near the buffet table. Some of the Elites will make their way to the table for refreshments (even the Forsaken need some grub! ), so keep an eye out for them when you attack. Take out the non-Elites when there’s a window and wait for your opportunity to take out the mark. 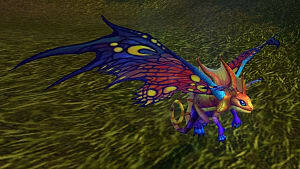 Your Thunder Bluff mark is Kroksy the Impregnable. Dalaran (Legion) > Caverns of Time > Fly to Thunder Bluff. Stormwind > Hyjal > Fly to Thunder Bluff. Golden Lantern (Pandaria) > Telepad to Ratchet > Fly to Thunder Bluff. Note: May require you to have a Level 25 pet. If you’re feeling ballsy, take the Undercity Zeppelin to Orgrimmar then the connecting one to Thunder Bluff. 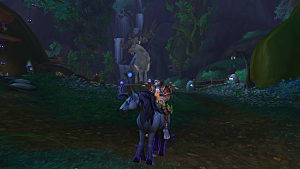 Kroksy is located on the main bluff, near the city leader Bane Bloodhoof (Coordinates: 56, 51). He is standing right by the unlit bonfire. Flying is the best way to get to him. Land in a safe spot and stealth. He is stationary, but has a buff that reduces the damage he takes by 99%. Pickpocket a key from him, then Sap and use that key to take his armor off to get rid of the buff. Once you do, he will run away from you and cast Cry For Help to call for guards -- so make sure to interrupt him and take him out quickly. Your Orgrimmar Mark is Auctioneer Xifa. To get to Orgrimmar, fly from Thunder Bluff. Or if you want to be ballsy again, take the Zeppelin. 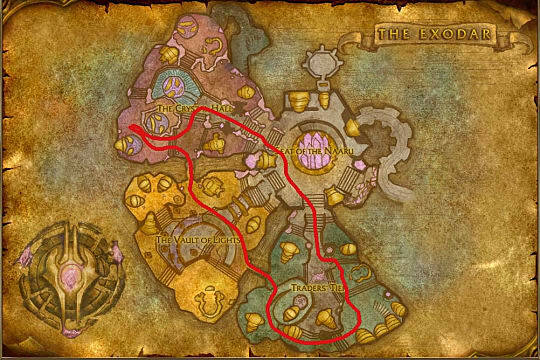 Xifa is located in the Auction House close to the front gates to Orgrimmar. She is on the far right of the auctioneer platform. The Auction House is always busy, so expect there to be enemy players ready and willing to kill you. Since there is an invisible wall behind all the auctioneers, you cannot Shadowstep or Shadow Strike her. You will have to run up to kill her, then Vanish if you are able. Beware. There is a stealth-detecting guard that pats into the Auction House -- so keep an eye out or you're sure to get caught. Once all the marks are dead, head back to Lillian and reap your rewards! Your Exodar mark is Ardaan the Solemn. From Dalaran (Legion), take the portal to Orgrimmar, then to Hyjal. From there, fly to Rut’theran Village on Teldrassil (it’s at the base of the tree). Then hop on the ship that pulls into the western dock (Elune’s Blessing). Ardaan and his bodyguard, a Crystalforged Demolisher, walk around the city in a loop. Distract or Blind the Crystalforged Demolisher so it will separate it from Ardaan. 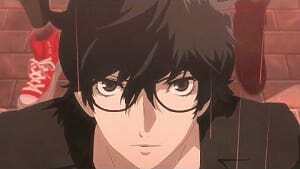 Otherwise, it will one-shot you if decide to attack without doing so. Your Darnassus mark is Taylenne Sweetsong. Take the ship back from the Exodar. You can get into Darnassus one of two ways -- through the glowing pink portal at the top of the hill, or by flying up the tree to the top (it’s a really tall tree). Taylenne is located just under the words ‘Warrior’s Terrace’ on the area map. She will make rounds around the party tables, mingling with the other partygoers. There are Elites at the party that hit like trucks. The best spot to take her out is over by the buffet table. 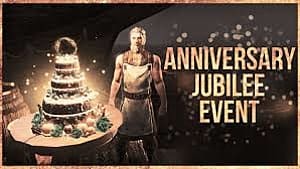 Some of the Elites will make their way to the table for refreshments, so be aware of this. Take out the non-Elites when there’s a window, and wait for your opportunity to take out the mark. Beware! There is a stealth-detecting guard that pats along the path just south of the party. So keep your eyes peeled or you're gonna get spotted. Your Ironforge mark is Corin Twinbellows. To get to him, you can take the portal from Orgrimmar to the Twilight Highlands, then fly to Ironforge. 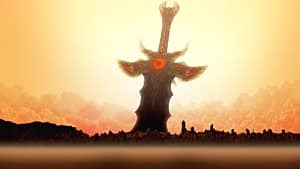 Corin is located in the High Seat, where the Council of Three Hammers resides. In fact, he’s right past the giant doorway on the right. Flying to the Gates of Ironforge, then finding a safe spot to land and stealth is probably the best way to go. He is stationary but has a buff that reduces the damage he takes by 99%. Pickpocket a key from him, then Sap and use that key to take his armor off to get rid of the buff. Once you do this, he will run away from you and cast Cry For Help to call for guards. So make sure to interrupt him and take him out quickly. Your Stormwind mark is Auctioneer Jaxon. The fastest way would be to hop on the Deeprun Tram from Ironforge. You could also take the portal to Twilight Highlands again and fly to Stormwind. 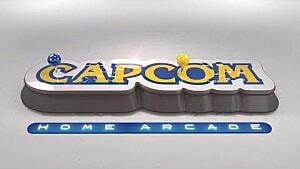 Jaxon is located in the Trade District Auction House and behind the far right podium. The only thing you really have to worry about here is other players who are waiting to kill you. So you'll want to kill Jaxon quickly and then Vanish as fast as possible. That wraps up our guide for completing the Hiding in Plain Sight quest. 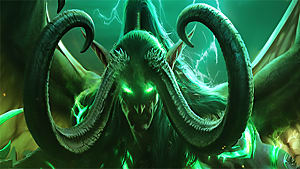 If you need more tips for grinding through Azeroth, check out the rest of our WoW guides!